A friend of mine is about to adopt three precious kids. In fact, they went from no kids to possibly having three children in their home next week. So brave and beautiful what they are doing. I feel so blessed to get to pray for them and support them anyway I can. They are caring for the least of these. My sister just returned from training camp for the World Race (her 11 month mission trip to 11 countries). Already, I can see it all over her. She is growing and changing. She will return a different person -no longer a girl, a strong woman of God. Already her view of the Lord is exploding. She is stepping out of the boat and following Christ. My tiny girls, in their own ways, are going through radical change. Bekah’s will and vocabulary seem to have tripled overnight. And with it, Grace’s understanding – we swam with her yesterday and her ability to follow direction astonished me. She is growing up. Parenting is challenging – there are days where it feels like we are battling for the souls of our kids – but stepping back and seeing progress is always a gift – and I was grateful to see some of that yesterday. My children are fearfully and wonderfully made. Justin covered for a precious friend of ours as the lead Worship Leader at a church in Southlake on Sunday. Justin is always the guy behind the guy, and for one brief Sunday, he was responsible for the direction of the service. Although it isn’t necessarily something we would regularly do (without much prayer and the writing on the wall – so to speak), it was impressive for me to see him take that on fearlessly. He did so well. I am humbled by my husband’s talents. He is a man after God’s heart. It made me start examining my life and my heart and wondering what is new in me. I feel like so many of the people I love are moving onto newer better things – while I wait. It feels like we have been here forever. But again I begin to battle my mind – realizing I cannot allow my feelings to rule. So today I chose to look around me and with gratitude I remembered this year – the blessings. The time with Justin, the Keystone Christmas blessing, the incredible friendships, the lessons learned. The Lord HAS DONE a new thing in my life. Already. It might not be the new thing I expected, but it is real nonetheless. He is doing a new thing. Just because I don’t see Him working doesn’t mean he isn’t – in fact, it means the possibilities are endless. Today, a Pastor who I respect tweeted “Wondering if I am the kind of man to whom God would entrust the things I am asking from Him….” That resonated with me. I spent today wondering the same thing. I have prayed for this thing – this ministry position for Justin – for years. It never truthfully occurred to me to ask “Am I the kind of wife to whom God would entrust the things I am asking of Him?” I can tell you this much – I was not that woman before this period of waiting. I can only hope and pray that I am that kind of woman, that kind of wife, that kind of mom, that kind of friend, today. It is my prayer that this trial has served to grow in me the strength and patience and humility and faith to support my husband in ministry. Then later this afternoon, Kirk Franklin, who I have had the GREAT pleasure to meet and who has had a huge impact on me tweeted, “Today if God gave you the thing you’ve been praying for, is your character strong enough to handle it? Grow… so you can Go.” Crazy right? The same message. That is not coincidence. When I was pregnant I read a ton of books about pregnancy… but few about parenting an actual human child. I quickly realized my error when my 3 week-old cried incessantly from reflux and I had to advocate to get her care. It made me wonder – in this time of praying and waiting and asking God to do this amazing thing, have I made the acquisition of the position the goal, or have I focused on becoming the person who would flourish in the ministry role alongside my husband that I am asking for? It’s a convicting idea. It’s the same thing with adoption – I don’t pray so that the adoption process would be smooth (although that is certainly a secondary request). I pray that our home would be a place of safety and belonging and family to children who have none of those things. When I envision our adoption – I envision snuggling with a tiny person and letting them know that I am their momma and that I will love them forever. So today was a day of clarity for me. One of the things I have been grateful about in this time of waiting is that there has always been something tangible we could pray for. We have not walked through this time blind – but have been able to pray step by step through this as we have considered where the Lord would lead us. And today I felt like the Lord gave me something really concrete for me to focus on and pray through for the next part of this journey. I want to be the kind of person who is ready to do the new thing that the Lord is preparing for me to do. Another crazy non-coincidence today is that the story of Noah kept coming up. First I read a blog about Noah and then I spoke to someone about him. This is another one of those stories that we have read since we were in diapers and so we often forget this was a real thing that happened to a real man. The story is in Genesis 6 – 9. Think about this – it took Noah months and months to build the ark. That is a long time to wait and to be mocked for something nobody around you understands – for a promise that seems impossible to fulfill (chances are good he had never even seen rain). And then the rains came, and he was stuck on the ark, while people and animals around him perished, for almost another year. We often tell that story like it was a short easy process. It wasn’t. It was impossibly horrifying and difficult, I’m sure. To see the wrath of God poured out on all of mankind – to witness it firsthand, and to feel so alone both in the time of preparation and in the time of fulfillment of the word the Lord gave you. To know that on your boat are the only survivors of a worldwide tragedy. There are not many people I know who would willingly sign up for that job. But Noah was faithful, and at the end of his difficult story there are three restorative things that happen that even today give us hope. First, Noah sends out a dove who returns with an olive branch, signalling that there is some life remaining on the earth and that they will soon be able to leave the Ark and return to “normal” life. 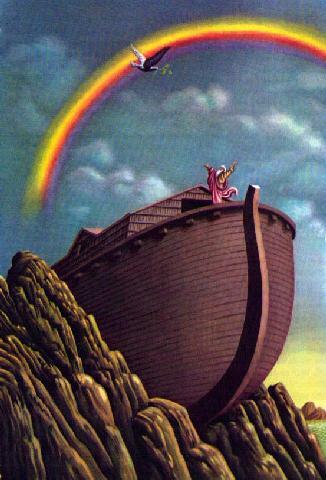 Second, God blesses Noah’s family and gives him stewardship over the entire earth. In looking at Noah’s story, a few things struck me. First of all, God was faithful. He did what He promised. His instructions and plans were very specific. Second, Noah was obedient. He may not have understood, he may not have enjoyed every minute, but he chose obedience. He obeyed to the letter of the law the word the Lord revealed to him. Third, in the end, God was good and His grace shone through. He sent a rainbow to shine even today as evidence of that promise. In our life – we are sending out doves looking for olive branches. Watching and waiting for the place where we can again plant our lives in ministry. And we don’t necessarily love or understand all of the circumstances that have come up against our family the past year. But we know that God is good, faithful, and full of grace. Nothing we have seen or experienced diminishes that. So we wait and seek to obey, knowing that in the meantime, God is preparing us for the home He is preparing for us. And we know that who we are and what we do in that place is more important than where we land. So we focus on who we will be there. And we know He is good. As long as He is near, we are exactly where He intends us to be.